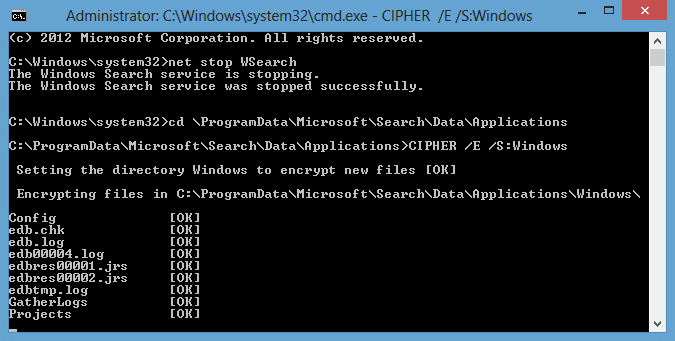 you're considering using the Windows Search Index encrypted files option. you're considering using 3rd party Windows Search add-ons that could also add sensitive data to those indices. you don't have whole drive encryption, such as Bitlocker or TrueCrypt turned on, perhaps because of possible SSD/Trim issues with encryption, or a desire to allow data de-dupe in backups, etc. you've read through this Microsoft TechNet article, and are still convinced you wish to proceed. This is an intermediate skill-level exercise, intended for home-lab environments. This is not something you should consider on a corporate issued system, which may already have whole disk encryption and power on passwords set. Setting up EFS for Indices requires admin rights to your Windows 8 operating system. This tip by John Savill at Windows IT Pro was the key to getting this all working. I'm not claiming that this encryption is absolutely necessary, or that EFS is better than BitLocker. It's not. I wouldn't even say that this procedure is even advisable for most users. I'm merely saying this quick method of turning EFS on that I developed seems to be working well for those normally tricky/untouchable index files. It doesn't seem to slow anything down noticeably, on my admittedly fast SSD based systems, or on my test VMs. And there seems to be no evidence of any side effects on Windows itself, with nary a scary error anywhere. No goofy entries littering the Event Log, for example. So that's why I'm comfortable sharing this procedure. Note that this is an entirely at-your-own-risk endeavor, with no certainty that Microsoft or I can possibly provide you with any support. Also note that backing up all your data first is entirely your responsibility! Ok, enough already, let's get started. Step-by-step guide, with a video walk through at the end. In a few seconds, Windows may restart this service on it's own. So please proceed to Step 4 promptly. Scroll back through the small command window, to be sure there were no 'file in use' errors encountered. If there were, just repeat steps 3 and 4 again until you see no errors. Using the up arrow keys to go back in your command history will make this easier. and hit enter, wait a few seconds, it should complete without any errors. and you should see a green folder entitled 'Windows', indicating it's been EFS encrypted. Double-click that folder, and you'll see the files within are also green. And you'll be able to see the size of that Windows.edb index file. You can also press Win+W and type Index then hit enter, to see the status of your Windows Search. Read more about EFS at www.groovypost.com/howto/windows-8-7-efs-encrypt-files-folders where the article kindly warns you to export that CERT file, should you wish to be able to recover any data inside any encrypted files or folders you work with. The article also demonstrates how easy it is to use EFS right from Windows Explorer, perhaps for your "My Documents" folder. That's all, your Windows Indexing should continue to work as it always did. But now you'll have just a little more peace of mind, even if you haven't gotten around to encrypting your entire disk quite yet. This is a TinkerTry exclusive article. As of June 11 2013, you won't find this technique anyplace else. I make no claims to be a Windows security expert, constructive feedback is always welcome!